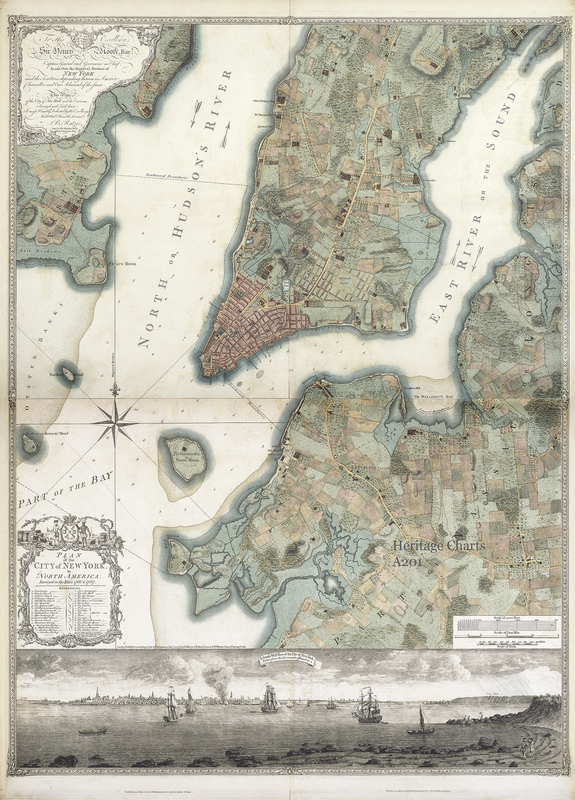 About 4 years ago, whilst researching in one of our source archives I came upon a beautiful map of New York. The entry in the archive log gave very little away as to what it was or indeed who had made it. This map (actually it is both a map and a plan) is especially significant for two reasons. 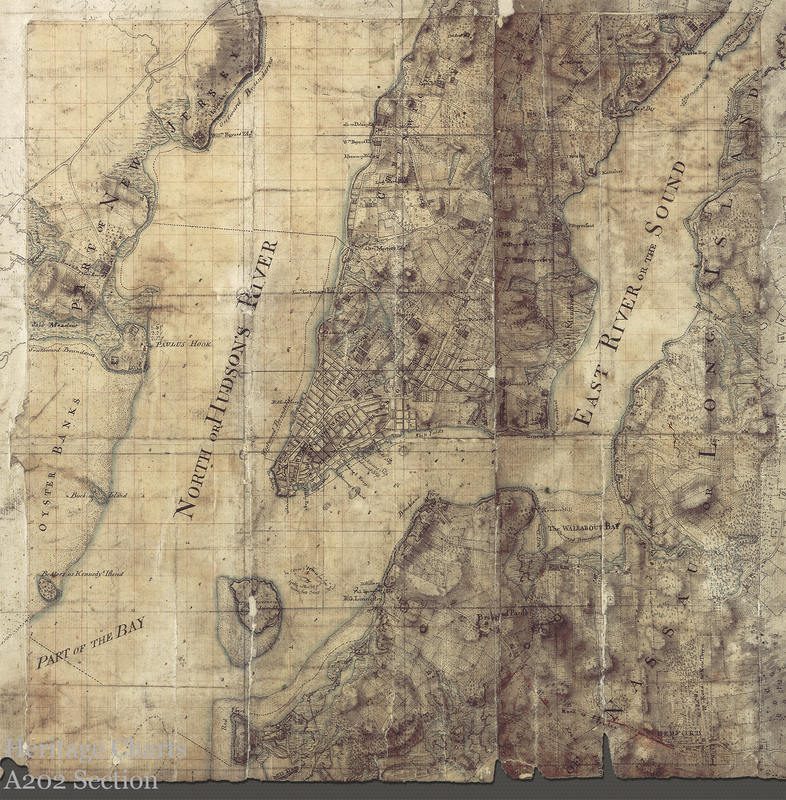 Firstly it is a never seen before map of British troop positions on Long Island (Queens) and up across Harlem Heights in 1776, just after George Washington had escaped north out of the city. General Howe’s headquarters are even marked.. 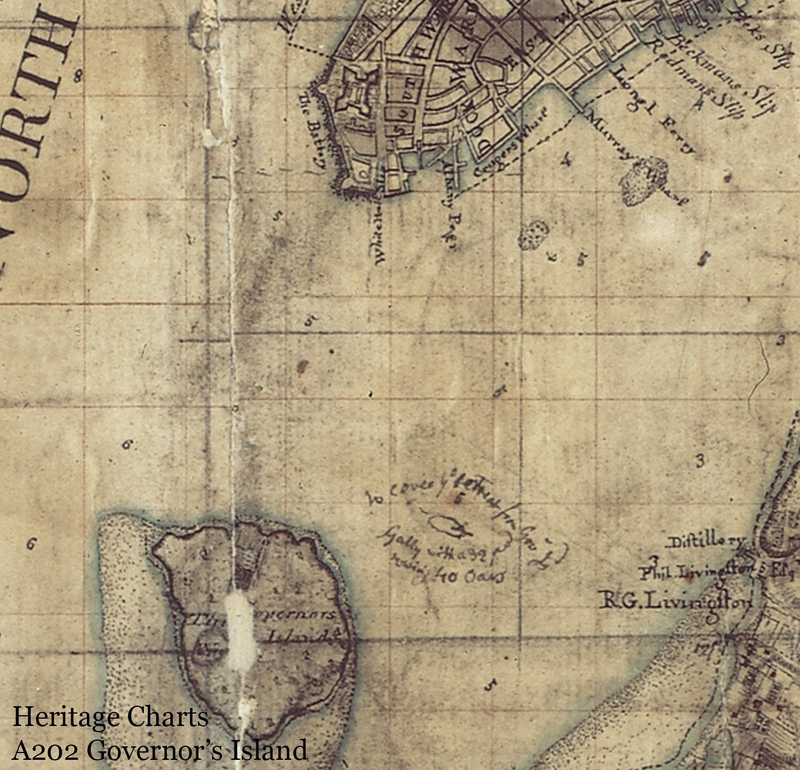 The map also contains, at its centre what I believe to be Bernard Ratzer’s finished drawing for what is now known at the Ratzer Map of New York City which was published in 1776 by William Faden and Thomas Jeffreys. If you could tell me a bit about Heritage Charts and the work you do there ? I am the founder and owner of Heritage Charts. 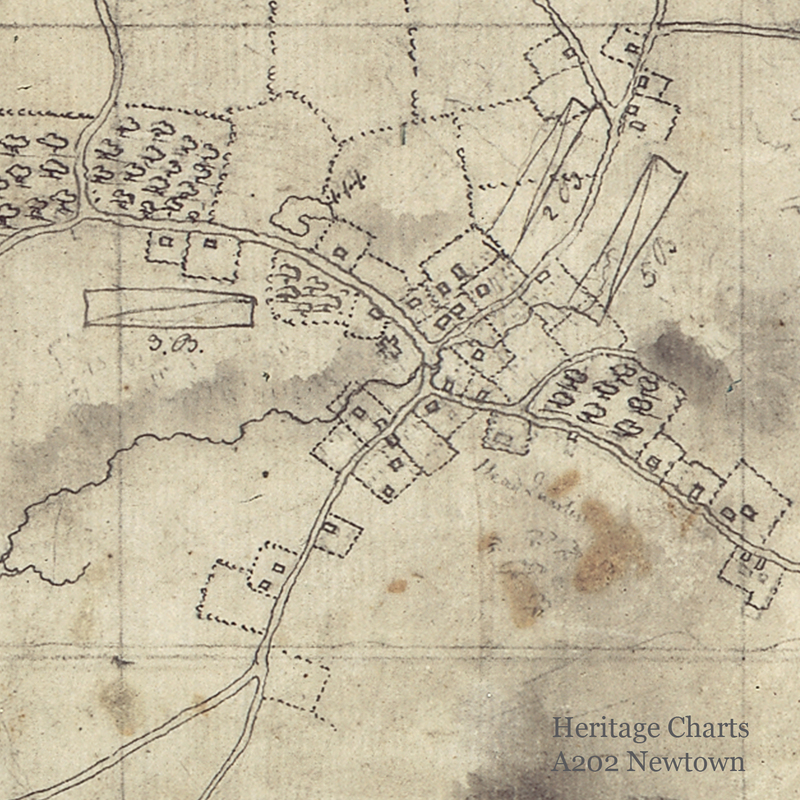 I have the best job in the world.. researching and bringing beautiful and historic documents in the form of charts, maps, plans and surveys to light. Heritage Charts is dedicated to opening up the British archives (we Brits have everyone’s history! ), and making otherwise unaffordable (never mind unobtainable) manuscripts to light and accessible to the public. The world is full of Antiquarian map dealers (many whom I call friends incidentally) who will sell you an original of a rare publication for more money than most people can only imagine. Heritage Charts is able to make available stunning giclée reproductions of these originals at fraction of the price of an original. 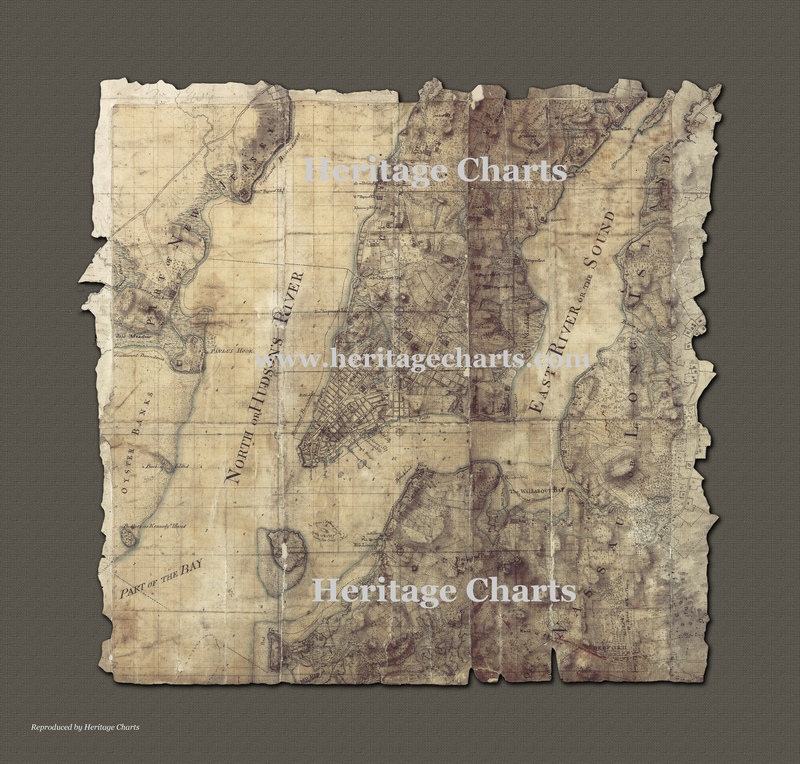 A large part of the Heritage Charts collection is comprised of reproductions of original surveys made by British cartographers and hydrographers, from which London publishing houses of the time such as Faden, Sayer, Bennet & Jefferys made copies and published. These manuscript surveys which form the basis of the Heritage Charts collection are one-off pieces. There is only one of each original, in the hand of the very men who did the surveying; men such as Charles Blaskowitz, Thomas Wheeler, Bernard Ratzer, James Grant, Willliam Owen, Henry Bayfield, George Gauld, James Cook, John Knight, & Samuel Holland. These ‘manuscript’ surveys are the Michaelangelo, Leonardo da Vince & Shakespears’ of their time. Priceless if they ever came on the open market (which they won’t because they belong to the British nation and are held in archives, public record houses and museums). This is the service Heritage Charts fulfills… uncovering. In the past few years Heritage Charts have actively tried to work with a number of historical societies and museums up and down the eastern seaboard of the United States (The original 13 mainland colonies). A glance at our ‘Logbook’ is testament to our travels and our dedication to bringing these beautiful, historic, document to life and also to our efforts to raise funds for such societies ad organizations. By the way, many people make the mistake that these are American documents. They are not, they are British, by the British, for the British… because the British were either attacking something or defending something at the time. 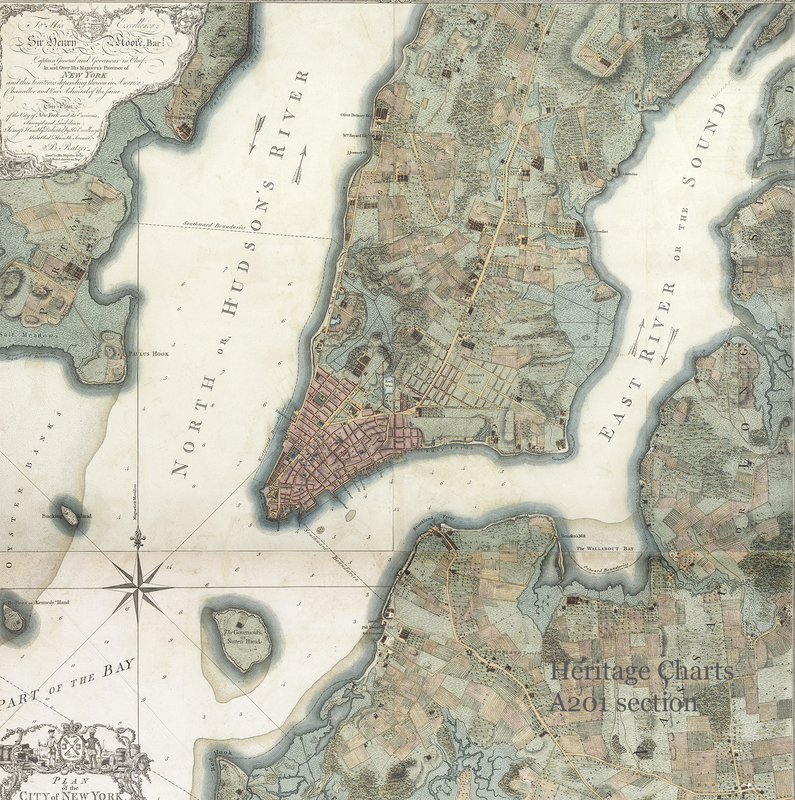 How did you come across the NYC map, and what about it piqued your interest? I was looking for documents relating to the New York and the Revolutionary war. Having uncovered some copies of the famous ‘Ratzer Plan’ of New York I came across various other documents relating to the war around NY in 1776 (some of which are still as yet unpublished. Amongst those which really caught my eye was a very brown and dusty plan which showed Manhattan and the surrounding districts of Long Island and NJ. What was of immediate interest was the inclusion on the map of british troop positions, including General Howe’s headquarters at Newtown, LI. Closer inspection showed the discrepancy in the paper used. 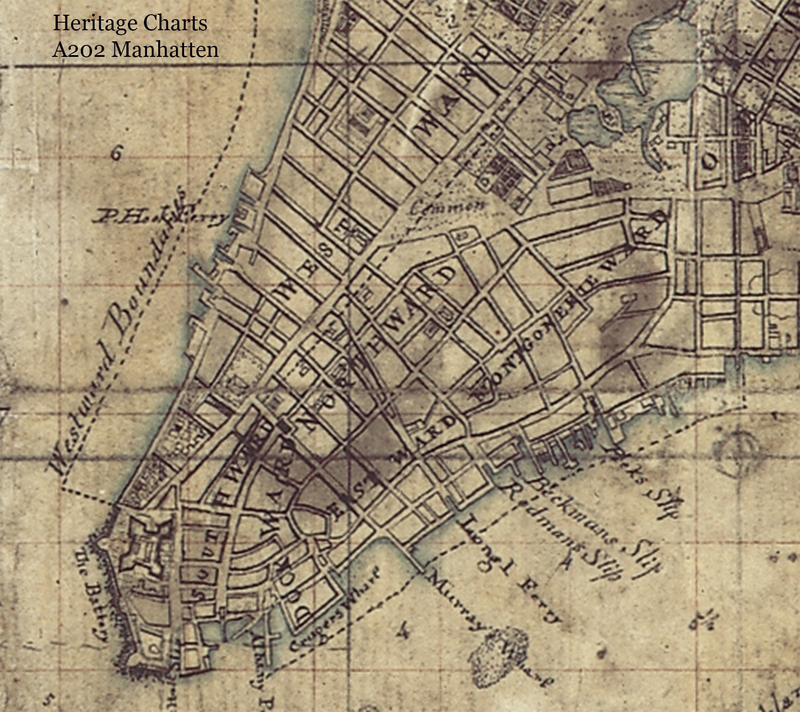 In the middle of the map was a small (12″ sq) piece of paper which clearly showed Manhattan in much greater detail than the ‘battle plan’ seemed to warrant. Even closer inspection (over several visits to view the document) revealed the fact that the central piece of paper was more familiar than I had originally thought. It was in fact identical in detail to Bernard Ratzer’s Plan of New York as published by William Faden & Thomas Jeffreys in 1776. Identical, except in one detail – the inclusion of tide arrows on the North (or Hudson) and the East rivers. In tune with fashion at the time amongst the London publishing houses was the inclusion of ‘tide arrows’ – these would have been added to the publisher’s copy. The reality of this map or plan is that in 1776 the British were at war. No matter how valuable this piece of paper may be to the world of map enthusiasts, historians and the like today, it was more useful to the British for it to be reused (after it had been copied) as the centre piece to a hurriedly made battle plan leading up to the British offensive North out of New York through Harlem heights and White Plains. The lower part of the central section are clearly missing or torn off as the words ‘Part of’ (in Brooklyn) are missing. Likewise the top half of the map/plan. This struck me at the time as being significant inasmuch as this was clearly just the middle section of a much larger plan of the British strategy in 1776-7. The fact that the central piece of paper – Ratzer’s original finished copy – was just a starting, or focal point, for the geography became even clearer. By this stage I’m not so sure that my interest was ‘piqued’, so much as pumped! What also needs clarification are the grid-lines which cover the central piece of paper – the ‘Ratzer Map’. These are copy grid lines which were drawn on an original in order to facilitate an accurate enlargement of the original. Scaling up would be the norm. This is a feature of countless British Admiralty surveys which I have seen in my research. Yet another clue as to the connection between this scrap of paper and the Faden and Jeffrey’s ‘Ratzer Map’ is the fact that the British Admiralty (and her surveyors), from the mid 1700s had been collaborating closely with the London publishing houses in the sharing of information and both cartographic and hydrographic data. This would have been just such an example. All surveys remained the property of the British Admiralty and were stored by them – often quite carelessly. Accurate records of manuscripts held by the Admiralty were not kept until many years after the end of the Revolutionary war although to be sure, once surveys were lodged with the Admiralty they rarely came out again, probably as no one knew where to find them again so poor was the record keeping! Even today it can be quite a challenge to track certain types of document down. How did you get involved with Bob and the Greater Astoria Historical Society? For a couple of years I’d know what I’d found. How important and how valuable (historically rather than monetarily – as the only copy of this is not for sale) this scrap of paper was – especially to American historians and map enthusiasts. For some time I attempted to get the attention of institutions such as NY Public Library, who sadly refused to even grant an interview. I therefore went ‘local’. Bob Singleton’s name came up in several discussions with assorted historical societies in Queens and Long Island and he was gracious enough to let me in to his office. What I found especially engaging about Bob was his very modern approach to history. He didn’t care that what I showed him was a reproduction. He totally got it when we talked about the fact that it was what was on the map which mattered, not whether I’d walked through the door with a priceless original. The fact that I was able to substantiate the source of the material was enough. What’s your gut feeling on the document, in terms of whether or not you think it’s authentic? I am very conscious that there is skepticism as to the original document’s authenticity although knowing the integrity of the source I do find it amusing. Most people have no idea what is hidden and lost in the bowels of their own national institutions. Why would such a find be so surprising? Now, when a private art collector suddenly comes up with a lost masterpiece, that may well be suspicious. When you have touched, and have worked with as many original documents as I have over the past few years, know where they are and understand their lineage you would know. If anyone is suggesting that two hundred plus years ago – because that is how long this document has been in British Admiralty hands – someone had the foresight to make a forgery, well, lets just say its unlikely. If anyone thinks I drew it, then think again, I struggle to draw a cheque! Here is an example of what concerns people who look at the map: The central square (the finished copy of the survey which was used to make the published Faden and Jeffrey’s Map) is very accurate. The surrounding piece of paper and especially the map drawn upon it is clearly not to scale and is possibly even inaccurate in its detail of roads etc. Does that matter? If you were a British surveyor in 1776 tasked with drawing a plan of the current battle positions for your Commander-in-Chief (overnight? ), what would you do?…. grab the nearest scrap of a starting point (Ratzer’s finished copy which was now redundant), stick it on to a larger piece of paper and sketch out the environs, putting in the salient information such as troop positions, villages, roads, ferries, redoubts, etc… This is by definition a Map, with a Plan at its centre. A map does not need to be accurate in a geographic sense. A plan does. My hope throughout all of this is that people – especially institutions – come to better realise that owning or displaying a perfect reproduction of an other wise out of reach original is better (and more realistic) than not having the information and beauty contained within available for people to enjoy and learn from. This is a story-board of significant magnitude. What are your next steps, in terms of trying to determine whether the map is real? Is this Bernard Ratzer’s original drawing for the ‘Ratzer Plan’ of New York? This section was added to at the time to become the centre piece of a battle plan for the skirmish up at Harlem heights.